This month, watch Olympians skate at the Saddledome, go to a pop-up playground and watch a ballet inspired by The Tragically Hip. Stars on Ice comes to Calgary on May 12. Photograph by Julie LaRochelle. It finally feels like spring in Calgary. If the long winter left you needing a flower fix, check out one of Amborella Floral Studio’s workshops this month. There’s a gemstone terrarium class on May 2, a summer planter class on May 23 and a peonies and Prosecco class on May 30.
k.d. lang, Elton John, Gordon Lightfoot – these artists and their music have all been subjects of Alberta Ballet’s portrait ballet series in the past. This year, artistic director Jean Grand-Matre has created a ballet around the work of The Tragically Hip, making it the first time he’s focused on a band. In All of Us, Alberta Ballet dancers portray an impactful story about a post-apocalyptic world while dancing to The Tragically Hip’s music. The first sale is the Reset Calgary Book Sale. Reset used to be known as Servants Anonymous. It has a new name, but it still does important work helping women who have experienced or have experienced sexual exploitation. Its annual book sale is giant and it takes over the Outpost Tent at Crossroads Market from May 2 to 6. The next sale is the CBC Calgary Reads Big Book Sale at the Calgary Curling Club on May 11 to 13. This one is a bit of a carnival with live music and storytelling. Funds raised from this one go toward Calgary Reads’ programming to promote literacy in Alberta. Join fellow beer lovers at the Calgary International Beerfest, which has more than 500 featured beers this year. Attendees have two days to sample (and vote for) beers from around the world and food from local restaurants. There will also be several beer seminars throughout the festival. 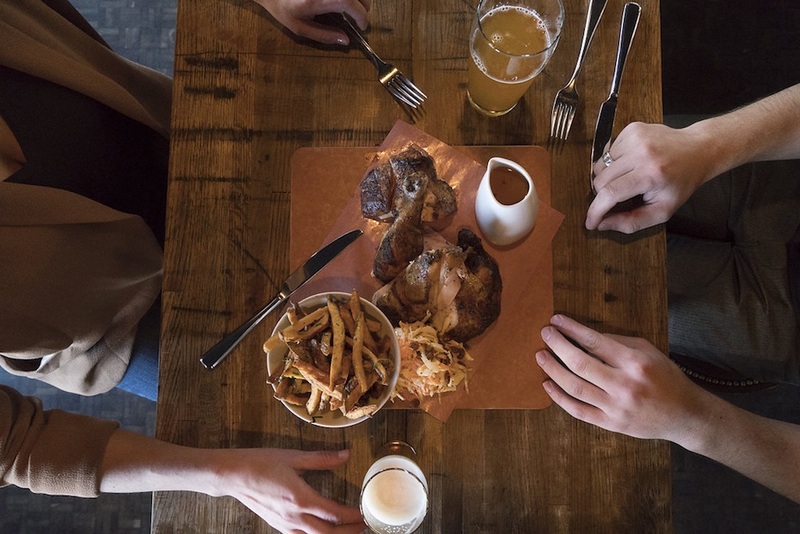 There’s truly no better way to end your work day than by taking advantage of one of the happy hour deals offered by many Calgary restaurants. Notable is the latest restaurant to offer a happy hour deal, which you can experience on Tuesdays, Wednesdays and Thursdays. Stop by between 3:30 p.m. and 5:30 p.m. to share a $30 chicken dinner for two or drinks like the $8 Grilled Grapefruit Swizzle. Trampolines, upcycled materials, play structures – you’ll find all this and more at the pop-up adventure playground coming to Shouldice Park on May 5. A partnership between Earth Day Canada and Springfree Trampoline, the free event aims to create an environment of unstructured outdoor play. The playground will be open from 11 a.m. to 4 p.m.
Meander through the Shoppes at the Devenish in between fashion shows during Runway Brunch. The runway part of the event includes two shows showcasing Kate Hewko’s spring collection. The brunch part is suppled by Butterblock and includes goodies like scones, quiche and those croissants stuffed with matcha, almond or spicy hummus. The event is $45 with all proceeds going to the YWCA Calgary. 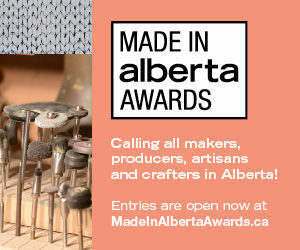 This Etsy: Made in Canada market marks the first time that Etsy Calgary has held a spring market to feature locally made goods. It’s also perfect timing if you still need to pick up a Mother’s Day gift. Held at Ross Glen Hall at Mount Royal University, the event features dozens of vendors selling everything from cheesecake to leather goods to soap. This is a plug for one of our own events, but we’re excited about it. 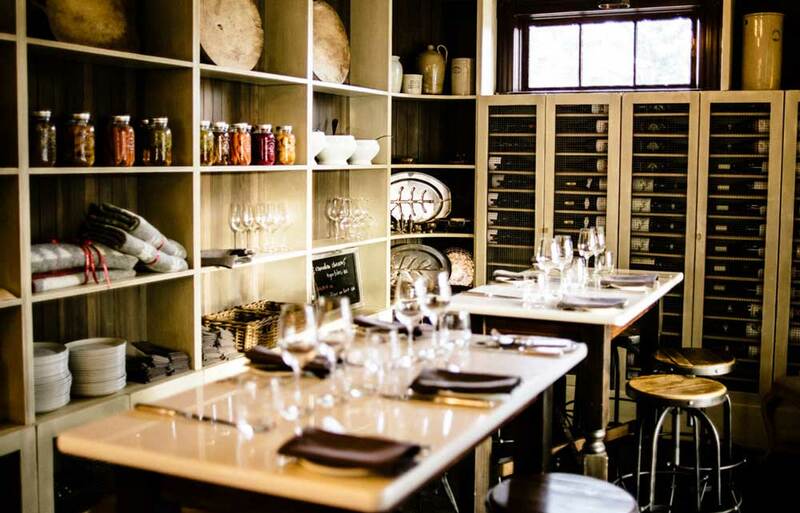 Deane House chef Jamie Harling is making a multi-course, spring-themed dinner that features local produce just for us. Harling loves local produce and can do magical things with it. The Deane House is literally in an old house at the confluence of the Bow and Elbow rivers, which is just about the best place to spend a spring evening. The evening will be cosy and delicious with wine pairings from the stellar selection at Deane House. This dinner is a few days before Mother’s Day if you are looking for an early gift. Tessa Virtue and Scot Moir. Photograph by Julie LaRochelle. They’ve made Canada proud at the Winter Olympic Games, World Figure Skating Championships and Canadian Figure Skating Championships. Now, some of Canada’s best skaters are coming to Calgary as part of the 2018 Stars on Ice Tour. Expect to see notable names like Olympic medalists Tessa Virtue, Scott Moir, Meagan Duhamel, Eric Radford, Patrick Chan, Kaetlyn Osmond, Elvis Stojko and more take to the ice for a night of skating artistry. Stampeders Fanfest is the unoffical kickoff to the football season and it’s your chance to hang out on the turf at McMahon Stadium with Stampeder plays, coaches and alumni. Get autographs, buy gear and play some games. The day starts in true Calgary fashion with a pancake breakfast in the parking lot before the gates open at 10 a.m. When Annie Oakley’s brother goes missing in 1887, she brings on iconic private detective Sherlock Holmes to solve the case. Along the way, Holmes and his trusty sidekick John Watson are faced with murder and robbery. Vertigo Theatre’s production marks the Canadian premiere of Sherlock Holmes and the American Problem. Afternoon tea isn’t just a thing of the past anymore – a handful of local restaurants are keeping the afternoon traditional alive with services that offer tea, scones, sandwiches and other treats in a lovely setting. It would also be a great experience to try out for Mother’s Day. Remember last year when colourful shipping containers were retrofitted into mini shops and plopped into an empty parking lot in East Village? EV Junction was a gathering space with a stage, food trucks, lounge spaces and those shipping containers selling wares from local business. The unconventional community space is coming back in 2018 and opens for business on May 18. The Calgary Philharmonic Orchestra brings the story of “The Boy Who Lived” to life this May. Listen to the orchestra play the score from Harry Potter and the Philosopher’s Stone live while the 2001 film about a young wizard’s introduction to the world of magic plays on-screen. Looking for a great deal? You’ll want to check out Nordstrom Rack when it opens in Calgary on April 26. The American retailer is bringing brand-name fashions to Deerfoot Meadows for extremely discounted prices – we’re talking as much as 70 percent off the regular prices. 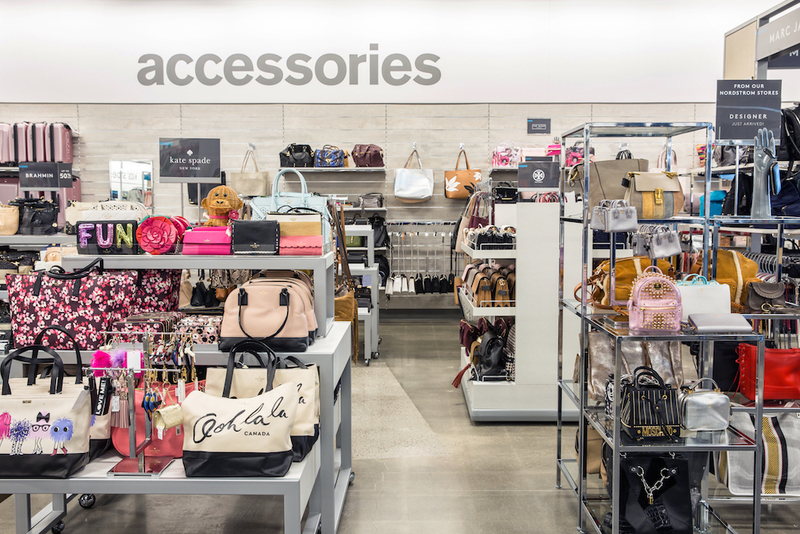 This is only the second Nordstrom Rack location in Canada and the first in Alberta. Click here to read more about the new store. Calaway Park re-opens for 2018 over the May long weekend, and there will be plenty of new attractions to check out at the local amusement park this year. Brave the Sky Wynder (the new ride is a 40-foot spiraling drop), see new stage shows later in the summer and treat themselves to a BeaverTail. Calaway Park’s opening weekend runs from May 19 to 21. After that, it’s open on Saturdays and Sundays until June 23 and is open daily after that. If you see a mass of tweed-wearing cyclist peddle by on Victoria Day long weekend, you are not going crazy. It’s the annual Victoria Day Tweed Ride. It’s a very elegant and leisurely bike ride around the inner city that starts at Village Ice Cream and ends at Oak Tree Tavern (both great places to grab and snack and hang out on a patio). Wear your best, bicycle-friendly vintage or tweed attire and join the ride. Pre-registration is encouraged, but you can also join the ride on the day. Looking to grab a quick bite with some friends, but can’t think of a place everyone will like? Consider checking out the new 8th Street Food Cooperative. Formerly a Ric’s Grill, the space is now home to a newly opened Noodlebox, Paros and Little Lot Diner. Each eatery has its own distinct dcor, vibe and seating area, but you can technically take your food and sit anywhere. And with three restaurants sharing one big space, that means there are tons of food options to choose from, including noodle bowls, pita wraps, breakfast dishes, burgers and more. 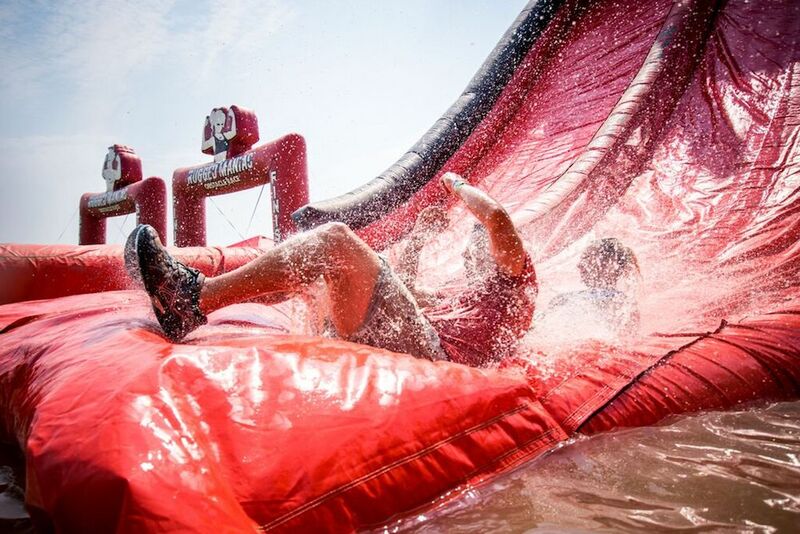 Rugged Maniac. Photograph by Gameface Media. Calgary’s spring and summer months are always filled with various outdoor runs and obstacle course races. There are at least 27 running and obstacle events taking place this spring and summer alone, ranging from the Scotiabank Calgary Marathon on May 27 to the Rugged Maniac obstacle event on July 28. Cyclepalooza goes on full moon bike rides every month and the next one is set for May 26. The group only pedals as fast as the slowest rider so expect a casual and social evening. Each ride is a little different, but it usually ends with a bonfire in a local park or drinks at a coffee shop or microbrewery. Make sure your bike has a light and leave the kids at home, this is an adults-only ride. The ride departs from Reworks Upcycle Shop. Local comic collective and non-profit organization Panel One puts a spotlight on Canadian comic creators. Its annual one-day festival returns for a third year with opportunities to meet local comic creators and children’s activities like story time and an art station where they can create comics of their own. East Town Get Down is a new music festival is taking over eight venues on six blocks of International Avenue. It’s just one night, but it includes performances from more than 60 bands including The Dudes, Rae Spoon, Dragon Fli Empire, Transit and Meisha and The Spanks. Get a wristband for $25 and hop from show to show. The newly opened Espresso Caf in Kensington offers a large selection of lunch and dinner dishes, as well as baked goods and coffee. But let’s be real – we’re all about the all-day breakfast menu, which features Alaskan Salmon Gravlax eggs Benedict, crab and fresh chives omelettes, brioche French toast, cinnamon and apple crepes and more.